A mocha and Ladder's signature avocado toast. "People are who we serve, and coffee is what we make," says Ladder Coffee & Toast owner Aaron Rivkin. Ladder Coffee's first brick-and-mortar shop on Riverside Avenue in downtown Spokane's west end seeks to serve its customers not only good coffee and toast, but personable connections. The idea for Ladder Coffee was born out of Rivkin's love for coffee and his troubled past. A four-year addiction to heroin in his late teens ended with a year of incarceration. Coffee gave him a second chance. After release, he began to learn the craft of coffee and started a roastery in Phoenix called Kream Coffee. A call to compete for Indaba Coffee in the U.S. Barista Championship brought Rivkin up to Spokane in 2015. While visiting, he realized that it was time to take the lead. He made the move the following year. "I would always have to be chasing someone else's dream, which is not a bad thing, but for me I knew that I had this dream inside of me that I was supposed to influence people," Rivkin says. In 2017, his front porch became the first makeshift location for Ladder Coffee. What started with 20 customers quickly grew to 120 within four weeks. The next step was a small drive-thru in north Spokane where he could serve more people. With plans to continue expanding, renovation began this past August on Ladder's new Riverside location, and the drive-thru was closed. The meaning behind the name Ladder Coffee represents Rivkin's past. "You never climb a ladder just to climb a ladder, there's always an end goal; something you're shooting for," he says. "For me, I've had to put a lot of rungs in my ladder to get where I'm at today." With Ladder Coffee & Toast, Rivkin aims not only to hire former felons and help them gain new skills for success in their careers and personal lives, but also to recognize that everyone has rungs on their ladder leading them to their goals. While developing the shop's menu, the needs of coffee nerds and average Joes alike were considered. The focus is classic espresso, with the option to add flavors such as caramel and lavender. Customers can get anything from a pour over ($4.50) to a latte ($4+) along with heartily topped slices of toast. 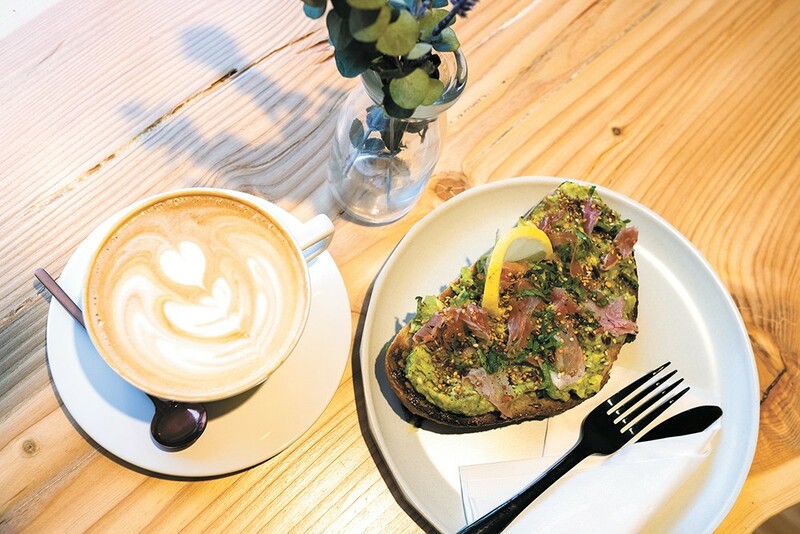 Millenials can "ooh" and "ah" over classic avocado toast with prosciutto and cilantro ($9), as well as toast topped with pear, fig, honey, ricotta and walnuts ($8). Large portion sizes should leave customers feeling full and content. Another feature of Ladder Coffee's new shop is a commercial roaster in the back of the store. Ladder serves its own house-roasted coffee that's sourced from Ethiopia, Costa Rica and Guatemala. Staff roast about 400 pounds of coffee a month and soon will be selling these roasts for customers to take home. Single-origin coffees are its focus, with roasts ranging from light to medium. The Riverside location, in one of the first apartment buildings built in Spokane, is just the beginning for Ladder Coffee. Rivkin hopes to open a few more locations around Spokane in old spaces he can restore and renovate and to move westward into Seattle and Portland. Down the road, he dreams of expanding across the country and the globe. The original print version of this article was headlined "Moving on Up"